Scrambling to access or find your configuration files? Take a look at Config, the easiest way to manage your application configuration across all your servers and environments. 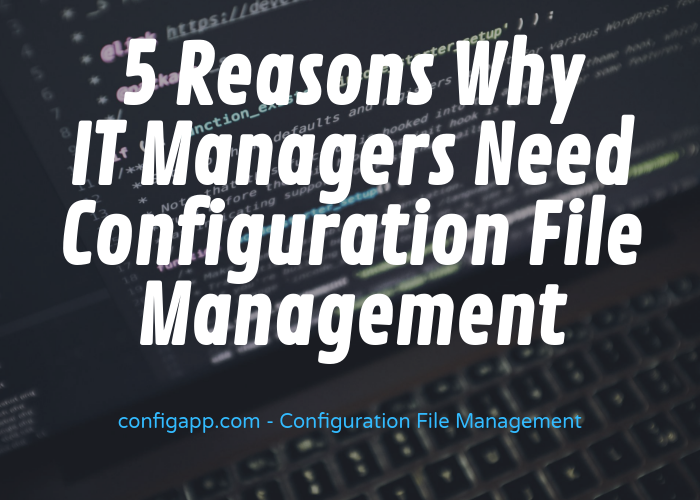 Here are the 5 reasons why IT managers need Configuration File Management from Config. Fix Prod issues fast. Users of any technical level can view or change configuration anytime, using their favorite device. There’s no need for VPN, remote access or sysadmin help. You can view all changes made since the last stable deployment. This will help you understand what’s new that might have caused the issue. You can quickly compare environment settings. This will help you understand why some environments are working and some are not. You can securely share configuration in a few clicks. Quickly get help from experts within your organization without exposing any sensitive information. Prevent Prod outages. You can passively review changes made to Production configuration, or actively approve changes before they get deployed. Get notified of Production changes, while filtering out Dev only changes. This will help you be on top of things that might affect Production, without the noise. Edit configuration with confidence using our type-safe, format-agnostic editing user interface. See the big picture. Your team can view all your application configuration across all servers in one place. Stop looking for credentials, IPs, and folder locations. Users have one click access to configuration documentation. Lessen complexity. Forget about VPN, server names, file locations, config formats, and invalid configuration values. Our web interface provides or makes it easy for you. Use your iPad and view application configuration in a standard, easy-to-use, type-safe way. Accelerate development. Build highly configurable applications without having to worry about managing the differences between environments. This is a common developer issue that we seamlessly handle for you. Utilize configuration version control for quick updates, easy sharing, history tracking and simple rollbacks.